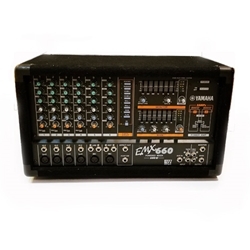 Six channel powered mixer with built in effects. This is a great sounding mixer that’s easy to use. It includes two 300 watt amps, a 7-band EQ, and two ultra high impedance acoustic guitar inputs. This mixer is in excellent comdition. All channels and effects work properly.